I live in: CRANSTON R.I.
comments: WHERE SHOULD YOUR HIP GO ON THE DOWN SWING ? ANY DRILLS TO HELP? It should rotate “around” to the left gradually . Think about just reversing the sequence of movements that you made on the backswing which should have been “arms, shoulders, hips”. SO: go “hips, shoulders, arms” on the downswing. Look at some of the golf club manufacturer’s web sites. Not sure where you find that on the “net”. 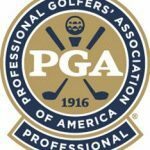 Contact the Colorado PGA office. comments: Why does shanking creep in towards the end of my practice sessions and why is shanking so much more prevalent with very short irons and half-swings. I already read about the 20 ball drill which I will try, just wondering why the shanks come and go so sporadically for me. Thanks. The shorter shots end up being the problem because we fail to accelerate the club to the finish of the swing…tendency is to “let up” on the swing which restricts any natural forearm rotation which squares up the clubface. I live in: dallas texas My_name_is: harry austin comments: with a swing speed of 89 miles per hour with a 5 iron, what flex rifle shaft would you recomend. i hitting to many shots that ballon when hitting into the wind and would like a more boring tajectory. thanks for your timeand effort. The equivalent of a men’s regular. Please direct this question to the Dallas Golf “club fitting and making” web site also found within “golf in the southwest”. comments: I am a 12 handicap, but have always had an unconventional swing. I don’t keep my left arm straight on the backswing. I can correct it on the range but as soon as I get out on the course my natural swing takes over. How do I teach myself to stop this? The left arm will continue to break down until you have developed a good, natural feeling shoulder turn. The full torso rotation is what will eventually allow you to “maintain the radius” or in other words, keep your left arm straight. Just trying to keep the arm straight will only prohibit a full swing. Develop the full shoulder turn, THEN think about keeping the left arm in the same shape, not necessarily “straight or stiff”. comments: I hit all of my clubs straight…no fades, slices, draws, or hooks…except for my driver. I almost always fade the driver or slice it if I swing hard. The only way I can hit the driver straight is to choke-up on the shaft or “severly” close the face; do you have any suggestions about what I am doing wrong and how to correct it? Thanks. If there is that big of a difference in shot pattern, get a local professional (such as Joe Tesori or Mike Doctor) to fit you in regard to your club selection. The only other primary distance is that the longer shaft will accentuate what is your normal swing tendency. Additionally, you probably make a different move at it due to a lack of confidence. Alternate hitting a club that you hit well with the driver at the range until you can make the motion feel more the same. comments: I am wondering if there are “tolerences” or standards around what the degree of loft for a given club can be. (for example a Pitching wedge must be 55+/-3 degrees) Are there any USGA rules or standards around this or can club manufacturers call them as they see them? Call em as they see em…….the tendency nowadays is to strong loft the clubs, but keep a low center of gravity to allow the ball to get airborn. comments: My cap is 7. I have a swing like DL III according to my CPGA pro . 2 problems: No matter what name brand set of clubs (irons & woods) I try, Icannot get any distance off my long irons and woods. I hit my 8i about 155 but hit 6,5,4,3, between 165 and 189 only. My driver, 10 deg Ping reg shaft, goes max. 230 on the fly. 5w (same brand) goes 200 max. Why?? 2 question : I 3 putt alot. I think I can be a 3-4 capper if I could putt. Main problem is distance control , also Wimping out bigtime on short curlers. Any tips? Thanks. May be a psyc problem? Confidence low. If your swing is really like DLIII, I doubt that distance is a problem. He generates consistently long distance via a full shoulder turn and good “extension” (in other words he does not lift the club with his hands, but makes the full coiling motion while keeping the angle of the club-wrist-arm the same long into the backswing). Three putting. 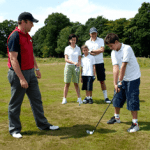 Practice putting while you look at the hole…..this will help you avoid ever leaving putts short. If you eliminate your distance problem one element at a time, it will be easier to gain confidence that you need to allow yourself to perform. Contact the PING web site and then send them an e mail…..they are famous for similar testing methods. comments: Recently I have been pushing my shots badly, sometimes even hitting the ball off the toe of the club. The ball goes a very short distance. I think my problem comes on the downswing, because I don’t really know what part of the body should lead. Please help. The path of your swing is moving to the left of the intended target line, that much we know…..I would guess that this tendency is from either “open” shoulders at address or from you starting the downswing with your hands instead of a gradual unwinding of the torso. 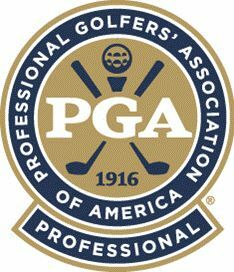 comments: While watching Inside the Senior PGA Tour, I heard Al Geiberger mention that he had a foot problem called Plantar Fasciitis. I am an avid golfer suffering from the same problem. I would like to find out what Mr. Geiberger did to resolve his foot problems. I am desperate as the golf season will soon be starting in Minnesota. You might contact the PGA Senior Tour. I am afraid I am not familiar.